Stay in the centre of Hamar, close to wonderful outdoor spaces and things to do. One of Norway’s largest conference hotels – ideal for small meetings as well as large conferences and fairs. Let us entertain you with our shows, and enjoy delicious meals in our restaurant. As a resident guest at hotel Scandic Hamar, you have access to both free parking and free WiFi. Our hotel restaurant, Horizont, is modern and relaxed, and our SANS Bar & Restaurant offers a wide selection of hot and cold drinks in addition to à la carte. Our hotel offers 17 modern conference rooms, with the largest accommodating up to 1,150 people. During your stay, why not stop by our fully equipped gym for a workout session, unwind in our sauna or borrow a bike from reception. We also have an arrangement with Hamar Tennis Club, just 150 metres from our hotel, allowing our guests to rent tennis courts. Scandic Hamar is located in a central, yet quiet area, just 10 minutes’ walk from Hamar centre. Here you are close to wonderful outdoor spaces and exciting activities for young and old alike. Take a walk from Hamar along the Mjospromenaden to Domkirkeodden, or take a bike ride out to Altungstad Golf Course, one of Europe’s most magnificent golf courses. The journey there takes only 15 minutes. Ankerskogen swimming pool is just a short drive away and is a brilliant place to keep the whole family busy. If you fancy some shopping while staying with us, you will find CC Stadion shopping centre right across the road, with a huge selection of shops and eateries. Scandic Hamar is located 50 minutes from Oslo Gardermoen airport and 1.5 hours’ drive from Oslo. 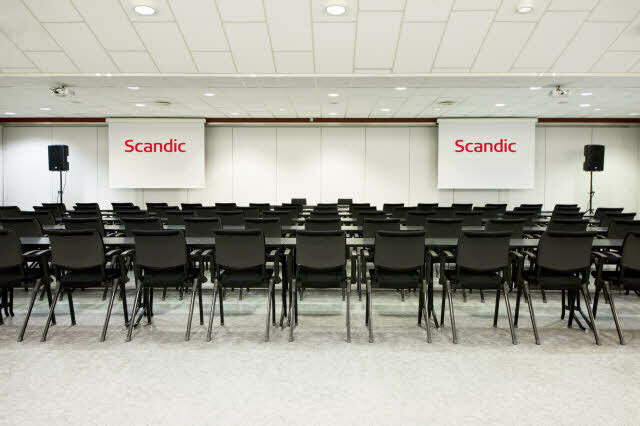 Scandic Hamar is one of Norway’s largest and most attractive conference hotels with conference facilities for up to 1,150 people and floor space capacity of 4,500 sqm suitable for trade fairs, etc.